This is the story of Philip Charles Hoffmann (1878-1959): shopworkers’ organiser. P C Hoffmann: shopworkers’ union leader. P C Hoffmann’s brief parliamentary career, as an MP from 1923-34 and again from 1929-31 was undistinguished. Yet his record as a union organiser, working tirelessly to improve the lot of shopworkers, deserves rather more than a footnote in labour movement history. 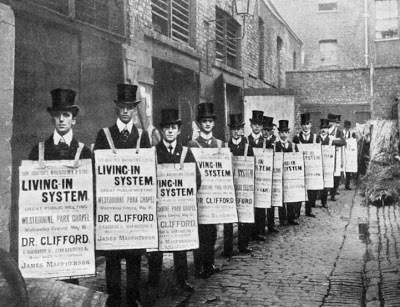 Hoffmann had lived the life of a downtrodden shopboy and was instrumental throughout the Edwardian era and beyond in the campaign to abolish compulsory “living in” – a system which subjected shopworkers to a petty tyranny that even governed their right to marry. The son of a wealthy silk mercer, Philip Charles Hoffmann (he seldom used his first names) was orphaned at the age of nine and grew up as a boarder at the Warehousemen’s, Clerks’ and Drapers’ School in Purley. He was apprenticed to a Holborn draper at the age of 16. “That I night I found myself along with half a dozen other young shavers in a small dirty room with six beds packed very close together, covered with coarse red and black counterpanes. The ceiling was very low and could be reached easily by stretching our young arms. Both walls and ceilings were bare, grimy and splotched. The two windows, being curtained with dirt, needed no other obscuring. The naked gas jet had a wire cage over it. The living in system was much disliked. With labour cheap, shop owners were able to make it a condition of employment, providing poor accommodation and food, charging high prices deducted direct from wages, and enforcing rules that ranged from compulsory lights-out and attendance at church through a system of fines and lock-outs. Many were even denied the right to vote. Hoffmann rapidly became involved in the shop assistants’ union and in June 1901 was active in the launch of a campaign against living in which captured the imagination of the capital’s shopworkers. After a packed meeting at Westbourne Park Chapel (advertised by Hoffmann and his fellow activists dressed in top hats and frock coats), the issue became one of the union’s central concerns. Hoffmann is pictured here third from the left, apparently wearing a monocle. Shopworkers on strike in 1901. In the months after this meeting, shopworkers began to demand improvements to their living conditions, and following a fire at one Dublin shop, employees refused point blank to return to their employer’s premises after rebuilding. But the first strikes against the system would not take place until 1907, when the campaign swept the country. By now Hoffmann was a full-time organiser for the union, and was actively involved in organising first negotiations and then strikes. First Debenham and Freebody, then D H Evans of Oxford Street and other lesser names in London, Oxford, Newcastle-under-Lyme, and most of all South Wales, where the union was strong, caved in and agreed to end living in. At C and A Daniels (drapers) of Kentish Town, a strike involving 24 shop assistants stretched on for 16 weeks before ending in victory. In Merthyr and Dowlais, however, the campaign faltered. Despite the support of Keir Hardy, two drapers held out, and issued writs for libel against Hoffmann and Hardy’s paper, the Merthyr Pioneer. Hoffmann was bankrupted by a court order to pay £250 plus costs. But the campaign went on and by early 1914, the whole of South Wales was free of the living in system. Hoffmann himself returned to the capital as the union’s London organiser, and became involved in winning union recognition. A strike at the Army and Navy Stores in 1919 laid the groundwork for a comprehensive London-wide agreement, and a protracted six-week strike at John Lewis of Oxford Street taxed his organising skills to the full – requiring him at one point to find emergency accommodation for 200 young women who neither would nor could continue to live in. In December 1923, Hoffmann was asked by the union to stand for election in South East Essex. Standing for the Independent Labour Party, he was successful, but lost the seat the following October and returned to the union as national organiser. Five years later he would again become an MP, serving from 1929 until Labour’s rout after the Ramsey Macdonald split of 1931. 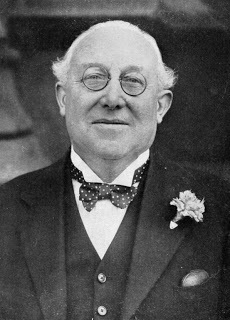 His attempt to regain the seat in 1935 failed, and he became union organiser for the Eastern Counties until retirement at age 65. Persuaded by, among others, his friend H G Wells (whose own experiences as a young shop boy form the background to the1905 novel Kipps), the Labour MP William Wedgewood Benn and union colleagues, Hoffmann – by now known almost universally within the union as Hoffie – wrote a history of the shopworkers’ union which closely followed his journey through the struggles of the early 20th century. The book, They Also Serve: The Story of the Shopworker, was published in 1949, and is the primary source for this biography. After his retirement, Hoffmann continued to attend conferences of the Union of Shop, Distributive and Allied Workers (USDAW), which had been formed through amalgamation in 1947. His 59th and final conference was at Easter 1959 in Scarborough. Soon after, on 20 April, he died at his home in Hampstead Garden Suburb.